Arrival at Cochin Airport/Railway Station check in Hotel/Resort. Sightseeing: Jewish Synagogue, Chinese Fishing net, Dutch Palace etc. Over night stay at Cochin. After breakfast proceed to sight seeing: Mattupetty Dam, Rajamalai, Eco Point etc. Over night stay at Munnar. After breakfast proceed to Thekkady, ( 110 kms. 4 hrs approx.) check in Hotel/ Resort. Sight seeing – Spices Plantation, Spices Shopping. Evening Boating at Periyar Lake, sight seeing – Wild Life Sanctuary, back to Hotel/Resort. Over night stay at Thekkady. After breakfast proceed to Alleppey, ( 160 kms. 4 hrs approx.) 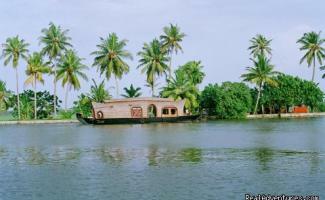 check in House Boat : Sight seeing : Man made Island, R-Block, Toddy Tapping, Paddy field, Village Life, Narrow Canals, River, etc. Over night stay at House Boat. After breakfast proceed to Kovalam, ( 180 kms. 2:30 hrs approx.) check in Hotel / Resort Evening enjoy Kovalam Beach .Over night stay at Kovalam . After breakfast proceed to sight seeing: Padmanabha Swami Temple, Historical Places, City sight seeing. Over night stay at Kovalam. Ready for departure transfer to Trivandrum Airport/Railway Station.